A close stool was an early type of portable toilet, made in the shape of a cabinet or box at sitting height with an opening in the top. The external structure contained a pewter or earthenware chamberpot to receive the user's excrement and urine when he or she sat on it; this was normally covered (closed) by a folding lid. "Stool" has two relevant meanings: as a type of seat and as human feces. Close stools were used from the Middle Ages (the Oxford English Dictionary gives the first citation as 1410) until the introduction of the indoor flush toilet. The close stool was sometimes called a necessary stool or a night stool. The eighteenth-century euphemism was convenience; the term was further euphemised in the nineteenth century with the term night commode, which John Gloag suggested may have derived its significance from a design for a "balance night stool" in Thomas Sheraton's Cabinet Dictionary (London, 1803); Sheraton's design was "made to have the appearance of a small commode standing upon legs; when it is used the seat part presses down to a proper height by the hand, and afterwards it rises by means of lead weights, hung to the seat, by lines passing over pulleys at each end, all which are enclosed in a case." This appears to be the link between "commode" as an elegant article of French furniture, and "commode" as a prosaic invalid toilet. "Close stool," in turn, is itself a euphemism for toilet chair. 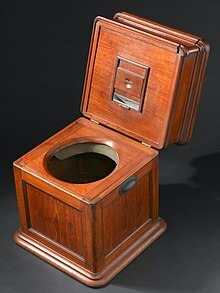 One meaning of commode survived into the twentieth century to refer to the flush toilet; "toilet" itself originally euphemistic. The French term for this item of furniture is a chaise percée ("pierced chair") as it often takes the form of a chair with a seat which raises to show the opening to the pot; similar items were made specifically as a moveable bidet. A nineteenth century development is the thunderbox. The Groom of the Stool was a high-ranking courtier who assisted the monarch with the close stool. ^ John Gloag, A Short Dictionary of Furniture, rev. ed. 1969, s.v. "close stool, close stool chair". This page was last edited on 11 June 2018, at 21:33 (UTC).